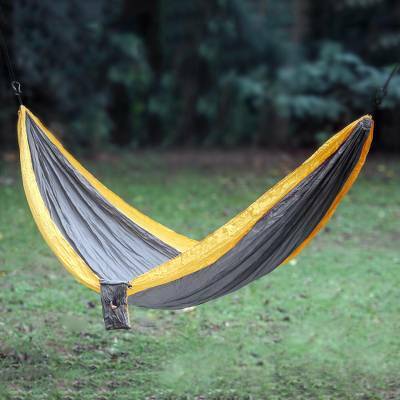 Grey Yellow Portable Parachute Fabric Hammock (Double), "Morning Dreams"
In light grey framed by deep yellow, this parachute hammock from Ticket To The Moon is ideal for every occasion, whether it is traveling, spending a day in the park, or just staying home. Play, relax, take your everyday nap or sleep in your hammock! The hammock is made of high-grade nylon parachute silk, which adjusts to the body, offering a comfortable sleep and ideal protection from rocky, wet, or sloping terrain, as well as from insects and small reptiles. This hammock is lightweight, strong, foldable, and sets up in less than a minute. Originally created by Ticket To The Moon and tested in all climates around the world since 1996, the camping hammock is made by travelers for travelers. Includes strong carabiners, an attached pouch to store the hammock when folded, and a funky crescent-moon shaped bag for more stylish storage which can also be used as a pillow for more comfort. Please note that the tree strap and rope package is available separately. Rolled up: 47 cm H x 12 cm Diam. Rolled up: 18.5" H x 4.7" Diam. You can find parachute hammock 'Morning Dreams' (double) by Ticket To The Moon in hammock categories such as Beach Bonfire Hammock, Nature Hammock, Nylon Hammock and Portable Hammock. Enjoy exploring these sections for other Novica treasures. "Instead of creating a corporate business, I wanted to establish the TTTM tribe: not only do we offer innovative products... we also promote different ways of life." Ticket To The Moon (TTTM) is the true inventor and original manufacturer of the camping hammock, based in Bali since 1996. TTTM was created by Charly via his adventure of traveling through India, where he enjoyed living and sleeping in hammocks for two years. Charly has been a bestselling artisan with Novica over the last 10 years. He has been committed to continually grow, improve and support the local communities and his staff. Over the years, he has built a great reputation for his brand, Ticket to the Moon, providing quality lifestyle products that Novica customers continue to enjoy. Novica is happy to support this achievement by featuring new TTTM products. "It all began 19 years ago, on the beautiful island of Bali, Indonesia. Bali is a unique place that you adopt but it is also a place that adopts you. The richness of the culture, the kindness of the people as well as the breathtaking landscapes made me want to stay in Bali. I built my home, my family and my business on this island, and my life belongs here. I found what I was always looking for. "While traveling with my girlfriend, we slept exclusively in traditional hammocks and, though they were comfortable, unfortunately they were heavy, hard to pack, somewhat fragile and difficult to clean. For all those reasons and many more, I decided to design a more practical type of hammock made from nylon and silk parachute material. "Once I created the prototype, I realized just how comfortable, compact and easy to use this new hammock was. My first thought was simply to create a new type of hammock that my friends and I could enjoy. However, over the years my design has gained popularity and a devoted following. Try one and you'll soon realize just how great they are!" Charly’s hammocks initially were made in his own home, and eventually he opened a small workshop with 20 employees. Since then, his venture has continued to grow and the hammocks have gained popularity reaching adventurers and dreamers all over the world. People often ask, "Who is the right person for the hammock?" The answer is simple – all people from all walks of life, men, women and children alike! In 2009, the Ticket To The Moon Foundation was created to provide assistance to the Sumbanese Kodi Tribe, based in East Indonesia. The Kodi people live in traditional houses in the wild landscape of Mandorak County, they are exceptional crafts people and their art is unique. "We have developed health, educational, cultural and development aid programs, and to date we have successfully helped the local community with building new infrastructure, education facilities, malaria prevention programs, and access to clean water. "Instead of creating a corporate business, I wanted to establish the TTTM tribe: not only do we offer innovative products, manufactured in good conditions from the best locally-sourced material, but we also promote different ways of life. Nowadays, TTTM is a team of 150 people working at sharing the hammock vibe to all dreamers worldwide."